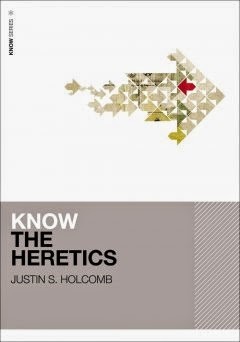 Over the past few days, I've been reading Know the Heretics by Justin Holcomb. There is a lot of talk about heresy these days. The frequency and volume of accusations suggest that some Christians have lost a sense of the gravity of the word. On the other hand, many believers have little to no familiarity with orthodox doctrine or the historic distortions of it. This book is a succinct guide, which is suitable for personal study or small group use. Know the Heretics is divided into twelve chapters, each covering a particular heretical view or figure. Each view is placed within its historical context in a succinct manner. Holcomb does a great job of contrasting the views both with orthodoxy as well as other heretical positions. At the end of each chapter, the author provides a modern context of each heresy and how it is relevant to today's Christians. I feel that the book is timely and helpful, and is a result of sound historical research by Holcomb. The author has taken material that to the average layman could be dry and uninteresting and has presented it in a very readable way. I feel it is very important for today's Christians to be educated in the controversies that the church has faced in the past. I would feel confident recommending this book to a broad audience in hopes that they would be edified about many of these views.